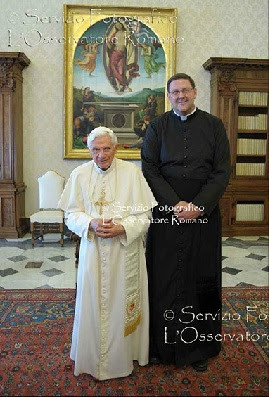 Apologies for the watermark, but here's your Shot of the Day -- Bishop-elect Gregory Parkes of Pensacola-Tallahassee, all 6-foot-8 of him, towering over the 5'4" B16 at the start of this morning's ad limina audience for the bishops of Florida (Vatican photo-gallery). With the Sunshine State's papal group-chat, the 14 Latin-church regions of the American bench have now all been received on their seven-yearly pilgrimage, the first of this pontificate. Next week brings the visit's close with the first-ever joint report of Region XV, the recently created arm bringing together the Eastern-church hierarchs based on these shores; previously, the Eastern prelates were part of the geographic group where they were based. The first priest of Orlando ever to be named a bishop on his March appointment, 48 year-old Parkes will be ordained on June 5th. By the looks of it, the rite might just be the first of its kind to require a ladder. 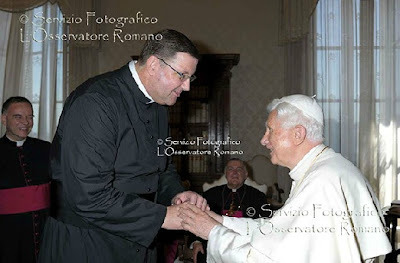 For in-depth reports from the days, the Mother of All Episcopal Blogs -- St Petersburg Bishop Bob Lynch's For His Friends -- has been running daily dispatches.